Successfully Added 18W LED Grow Light - Two Lights, Flexible Body, 24 Red LED, 12 Blue LED, Desk Clip, 400 To 840nm, 500 Lumen to your Shopping Cart. With this 18W grow light, you’ll be able to grow your plants and flowers like never before. The grow light features a clip thanks to which it can be easily attached to your desk or table. It furthermore has 360-degree flexible arms that hold the two lights in place. This extraordinary design brings along great control for you to effectively target the light at your plants. 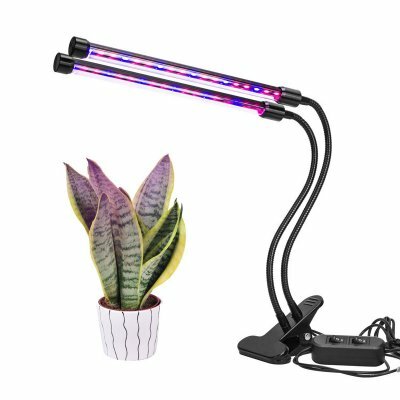 Coming with two separate lights, you’ll be able to fully illume your plant from every angle. Whether you choose to focus the light on the entire plant or on a specific part to encourage its growth in that area – this grow light is sure to meet your demands. Each of the included lights features 12 red and 6 blue LED lights to fully stimulate the growth if your plants. With a wavelength of 400 to 840nm, this gadget is guaranteed to make your plants grow like never before. With these grow lights at your side, you’ll be able to stimulate your plants to grow and blossom faster. Like this, you’ll always be surrounded by colorful flowers while at home. Additionally, the grow light can also be used to stimulate vegetative growth. This makes it the perfect gadget for those of you that wish to grow fruit or vegetables indoors. Thanks to its LED lights, this grow lamp uses significantly less energy than traditional grow lights. Due to this, you’ll be able to save energy and money while working in an environmentally friendly manner. The grow lamp can be powered either through its USB port or through a regular power cable. No matter the type of plant or flower, this LED grow light is sure to boost their growth and yield. From now on, you’ll be able to grow your favorite plants with the minimum amount of effort. This 18W Grow Light comes with a 12 months warranty, brought to you by the leader in electronic devices as well as wholesale electronic gadgets..